Looking for a quiet and peaceful self catering holiday in France? Our self catering accommodation is located in the Haute Vienne which is part of the famous Limousin region of central France. It offers the relaxation you need with self catering accommodation and is the ideal place to forget about stress and to unwind and relax. Situated in a quiet hamlet near the town of Chéronnac, this recently restored typical French farmhouse boasts a self contained gîte, and spacious main house. The gite is available throughout the year and the main house during the summer months at prices that are very reasonable. The beauty of this self catering accommodation is that it comprises two separate parts which can be let together or independently. Ideal for two families holidaying together, but still wanting privacy. 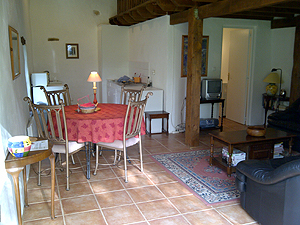 The gite comprises: living area, a kitchen area, bathroom with shower and bedroom above on a wooden dais. The large French windows leading to the outside give the gite a light and airy feel. The gite is suitable for up to three people. The main house has spacious living areas: an entrance/dining area, a large lounge, big fitted kitchen, utility room, three bedrooms sleeping up to five people, and a shower room. The nearby picturesque towns of St. Mathieu and Rochechouart have all the amenities you will require. There are plenty of places to visit too. Some of the attractions include Limoges, Futuroscope near Poitiers and Oradour sur Glane. The garden has ample space for children to play, with no traffic worries and plenty of opportunities for exploration. There is also an area for outdoor dining and a barbecue.